Grant Rights of Ways to Hyperloop, JPods and networks 5 times more efficient than highways for 5% of gross revenues. Cut GHG's 50% by 2025. Grant Rights of Way access to alternative networks that are 5 times more efficient than roads. Flip the regulatory processes from writing exemptions to writing rejections of innovations that are 5 times more efficient. 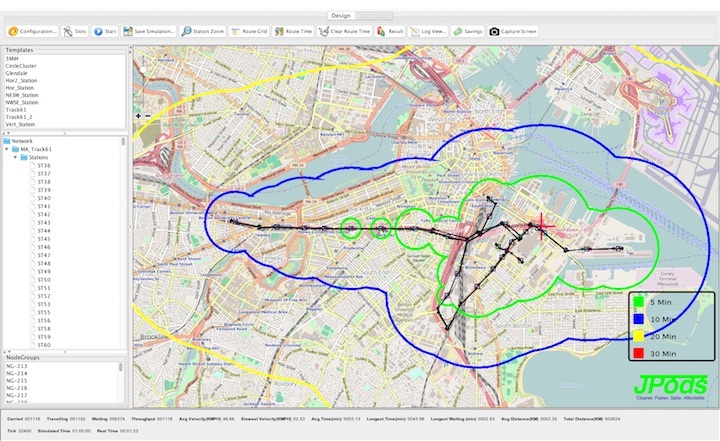 Build the Physical Internet® city by city with JPods-like local networks. Cross-connect local networks with Hyperloop/ET3. Pay cities 5% of gross revenues for use of airspace over city streets. Create jobs building solar-powered mobility networks that are 5 to 50 times less expensive per passenger-mile than oil-powered roads and coal-powered transit. Save families a monthly car payment on transport costs. Above ground networks, gather at least 2 megawatt-hours of renewable energy per average mile of network per typical day. Specific network franchises will be governed similarly to how communications networks are governed. Flip the regulatory processes from writing exemptions to established policies to writing rejections of innovations that are 5 times (5x) more efficient than established policies. Currently only the ultra-rich, such as Elon Musk, Richard Branson can gain access to Rights of Way for Hyperloop because of the uncertainty of costs in surviving the approval process. The 140,000 miles of freight railroads in the US average 476 ton-miles per gallon, 140 times the efficiency of moving people in cars on roads. Despite rail efficiency, since The Federal-Aid Highway Act of 1956 removed efficiency as a market force, nearly half (120,000 miles) of the country's railways have been bankrupted/abandoned. The Personal Rapid Transit in Morgantown has delivered over 110 million oil-free, injury-free passenger-miles since 1975. In that same period, over 1.7 million Americans died on roads. Thrill rides and theme parks regulated by ASTM F24 have a safety record of 0.2 injuries per million. DOT has a death rate of 106 deaths per million. Theme parks are cities designed around pedestrians. There are powerful transport networks, but they must be made intrinsically safe to pedestrians. DOT state/Federal decisions results in bike riders being killed at a rate nearly 5 times that of bikers in Europe. The Parasitic Energy Ratio illustrates the scale of government policy favoritism to roads that are a root cause of Climate Change. 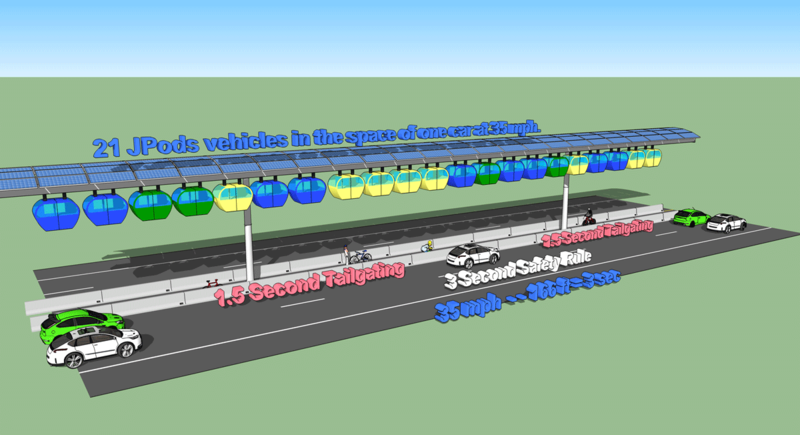 Moving two tons to move a person in start-stop urban traffic uses more than 100 times the energy required for solar mobility networks. Remove the parasitic mass, remove the repetitive applications of power and it is practical to remove 95% of the energy (GHGs) to move people and cargo in cities. 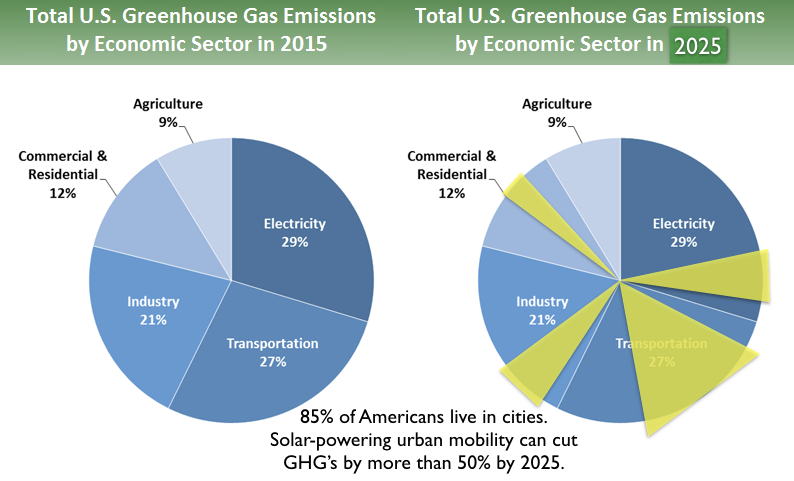 Cut US urban GHGs 50% by 2025. The hostility of current laws to cleaner, faster, safer, and more affordable transport networks is reinforced by the nature of bureaucracies. Bureaucracies are the institutionalized suspension of judgment; they enforce rules. Writing an exemption to their rules is very hard. The Solar Mobility Act flips the process so anyone can build solutions that are 5 times more efficient than roads. Link to 8-minute video on why capital will invest to convert costs into value. Capital will not invest without a known cost of regulation. In 1968, The Mother of All Demos demonstrated nearly every technology of the modern Internet. It was only after the courts declared the Federal communications monopoly unconstitutional in 1982 that these innovations commercialized. Passed by Secaucus Ordinance 2014-23 then blocked by NJDOT. 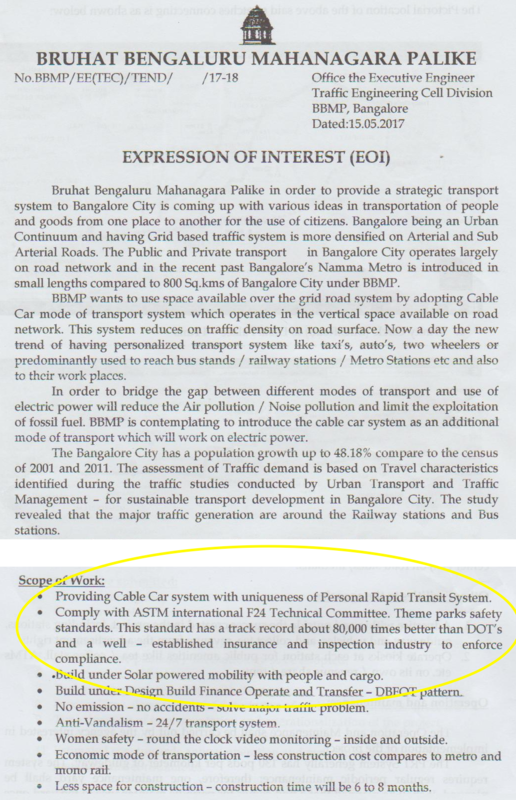 The basis of Bengaluru's Expression of Interest 2017. As the Solar Mobility Act is passed city by city, create an economic self-interest in changing economic lifeblood from oil to ingenuity. Create jobs that solve traffic problems and cut transportation costs (see Benefits and Cost Sections). Oct. 20, 2017, Governor Hogan of Maryland announced the city is building Hyperloop, but that effort is restricted to only 10 miles because of Rights of Way barriers. Adopting the Solar Mobility Act would allow more than the rich and famous to also start projects. Bengaluru's adopted the Solar Mobility Act as the basis of its Expression of Interest. This project is moving forward quickly. Link to article in the press. 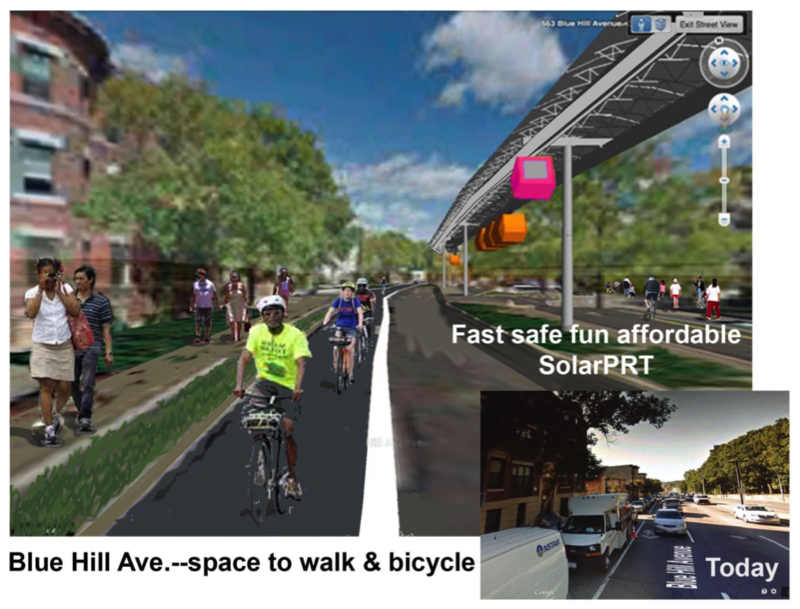 Projects at MIT's campus if the Solar Mobility Act (S1970) is passed by the state. 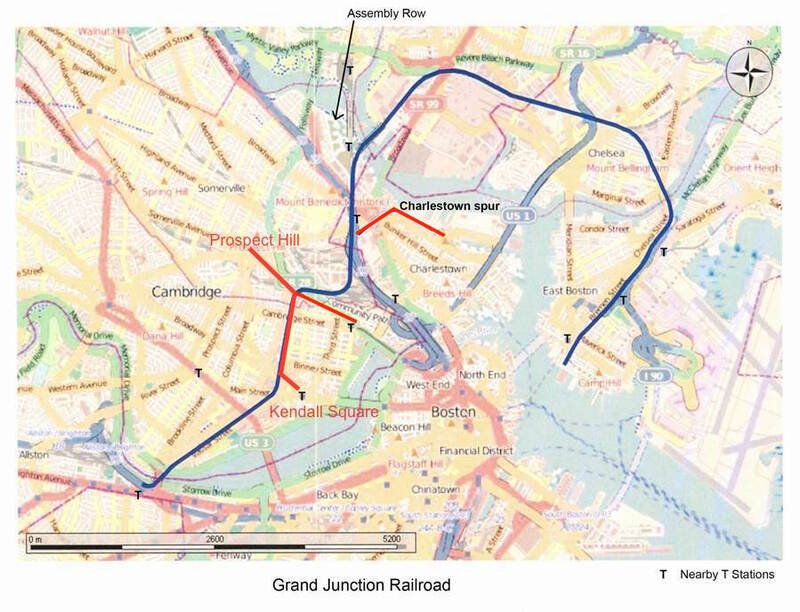 Build the Grand Junction Line from Fenway to Everett to Logan (thru the MIT campus). Build Track 61 from Fenway to the Seaport District. Build between North and South Stations in Boston. Here is a map of the Grand Junction Line. It runs from near Fenway Park through MIT and connects to Logan Airport. 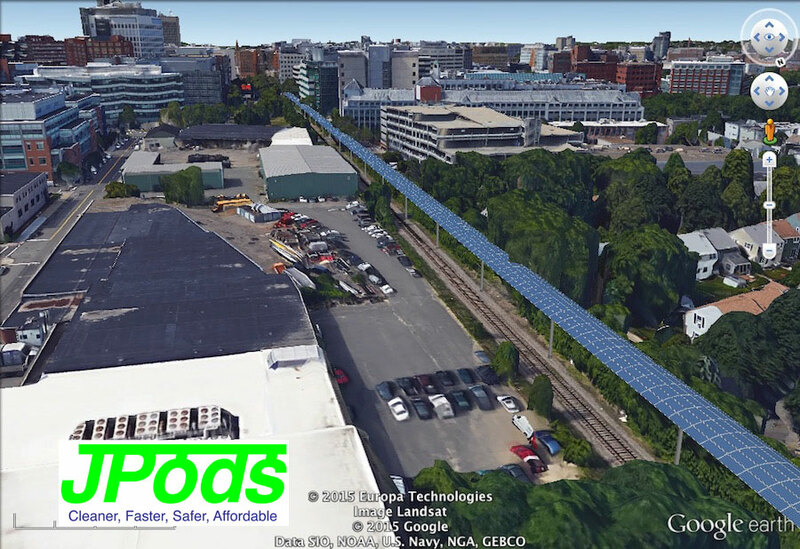 JPods will privately fund building this network and power it with the sunshine that hits the rails. Solar collectors over the rails gather about 40,000 vehicle-miles of power per mile of rail per day. Here is a Route-Time™ map from Fenway area to Logan Airport. Route-Time software to calculate network capacity, travel times, etc. can be downloaded from the JPods website. Here is a Route-Time map from the Seaport District to the Fenway area. Here is a letter of support from the Convention Center for building such a network. 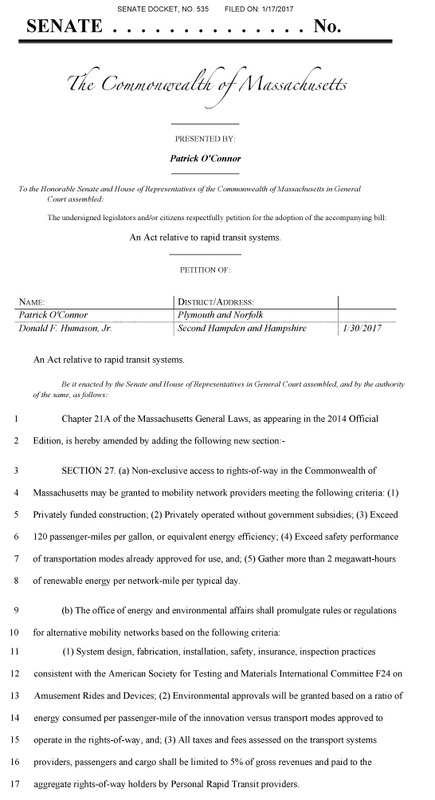 Here is a link to the Oct. 2015 hearing with Boston City Council on building solar-powered mobility networks and the passing of Senate Bill S1837 (the last legislative session copy of S1970). The only barrier to changing the lifeblood of our economy from oil to ingenuity are regulatory barriers. 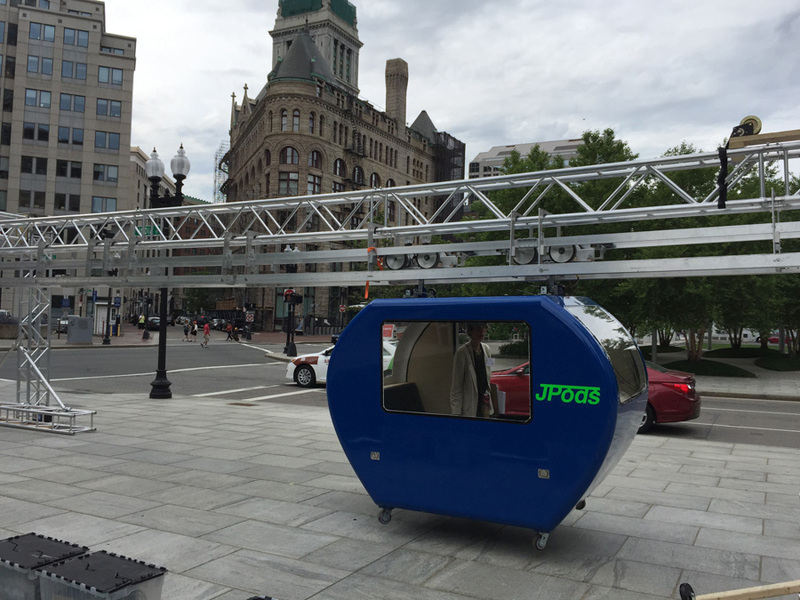 Here is an image of a JPods demo setup on the Boston Greenway. Route-Time map of combining these three networks in Boston. Slavery, Climate Change, foreign oil addiction, debt all have the identical cause, a "needful" majority. Exploiting Illicit Energy, a dependence on energy outside self-reliance, a Tyranny of the Majority obtains short-term benefits at the expense of a minority. Federal roads and grid define the structure in which economic competitions determine winners and losers. To be economically competitive in America requires families to have 2.28 cars. A car costs about $8,469 per year. To endure these costs, families need cheap gasoline. A "needful" majority votes for cheaper gas prices today with indifferent to the long-term harm to their children. Slavery sacrificed a minority based on race. Oil addiction, debt, and Climate Change sacrifice a minority based on age. The liberty and future labor of every child has been mortgaged for $63,649 via Federal debt to fund Federal programs. The only difference between selling a man into slavery for $63,649 and mortgaging a child for $63,649 is the use of debt to delay and confuse accountability. Economic self-interest, not moral disgust forced an end to Federal support for the expansion of slavery in America. The same will be true of solving Climate Change. A Tyranny of the Majority votes for Federal policies that increased foreign oil needs from 20% to 65% between 1970 and 2008. Federal policies continue to fund terrorist with oil-dollar. Oil-wars have been perpetual since 1991. A strong "free labor" minority forced a shift in slavery expansion with Lincoln's election. The "free labor" minority acted out of their economic self-interest. As the Civil war became long and bloody, it morphed into majority support to end slavery. As jobs create cleaner, faster, safer, and more affordable mobility networks economic self-interest will end Climate Change as it did slavery. 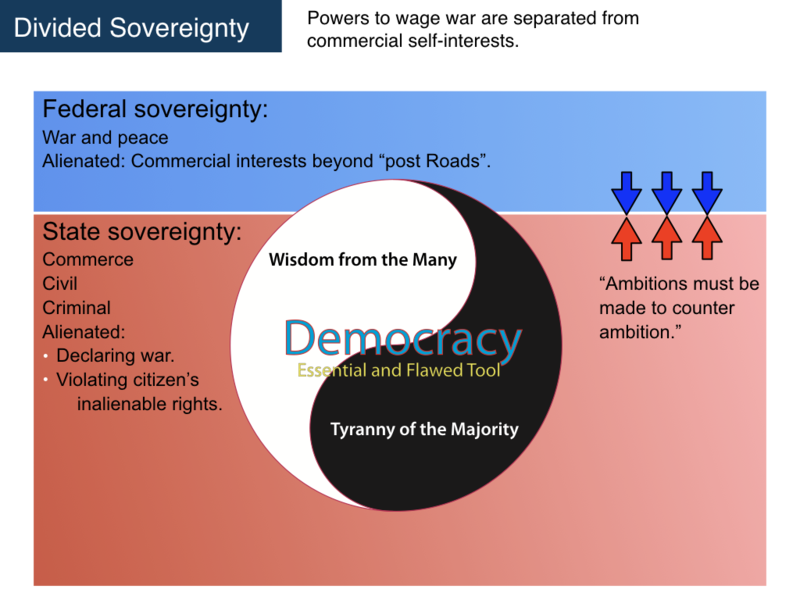 Unlike the Constitution's accommodation of slavery, the Constitution specifically prohibits of Federal highways that mix commercial self-interest will war-making powers. This mixing is the root cause of Climate Change. The Boston Tea Party was a lesson to the Framers. It demonstrated the defect of giving the general government (King then, Federal now) a power to wage war and a commercial self-interest in transportation monopolies. On September 14, 1787 in the Constitutional Convention, Dr. Franklin proposed the Federal government be granted powers to tax to build highways and canals. Madison recommended it be raised to a power to form corporations useful to the Federal government. Then, George Mason reminded the delegates of the King's transportation monopoly and they voted 8 states to 3 to restrict Federal involvement in infrastructure to no more than the duty to defend free speech, to assure letters could be delivered by "post Roads" if no other roads were available. 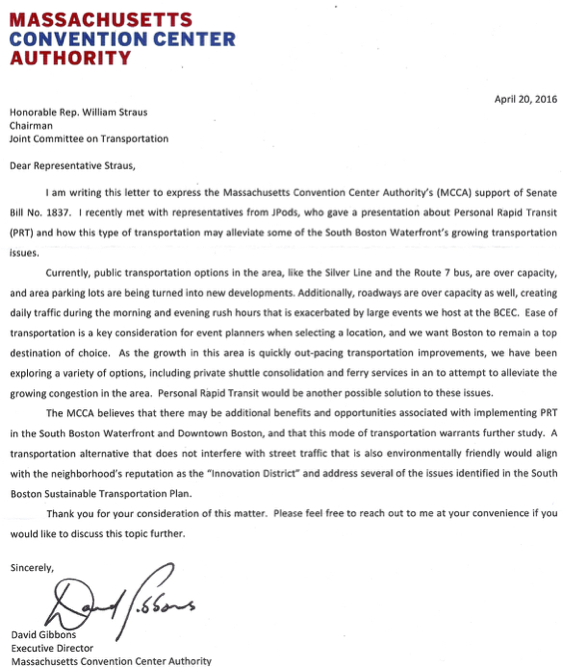 Link to five Presidential veto messages that explain the "post Roads" restriction. Mixing war-powers with commercial self-interests is forbidden. Federal taxing to build oil/coal burning infrastructure to help sell cars is forbidden. Violating the "post Roads" restriction is forbidden. Federal commercial monopolies stifle liberty, cause Climate Change, have required perpetual oil-wars since 1991. Passing the Solar Mobility Act restores liberty to innovate networks 5 times more efficient than roads. Choices: Society's tolerance of disruptive minorities offering choices. There is no minority as tiny and disruptive as commercial innovators. Wisdom from the Many: The aggregated wisdom of all of us, with each acting in their own self-interest, is wiser than the wisest of us at choosing between choices. In every city, people hate traffic. Moving two tons to move a person costs 10 times (10x) the cost of digital urban mobility networks. Savings come from removing the parasitic mass. Solar-powering this Physical Internet® preempts that source of greenhouse gas generation in further saves 6x on Net Energy. 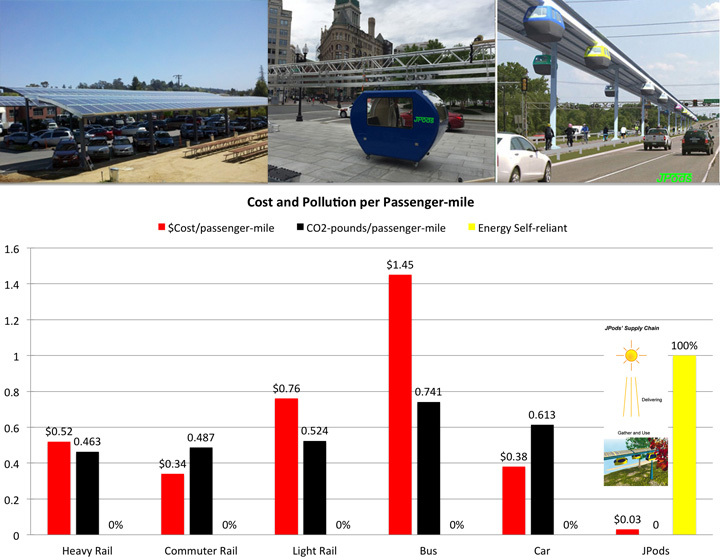 City by city, then state by state, adopting the Solar Mobility Act can convert traffic costs into revenue to pay for the transition to cleaner, faster, safer, and more affordable mobility networks. $6.7 billion per year on foreign gasoline (link). 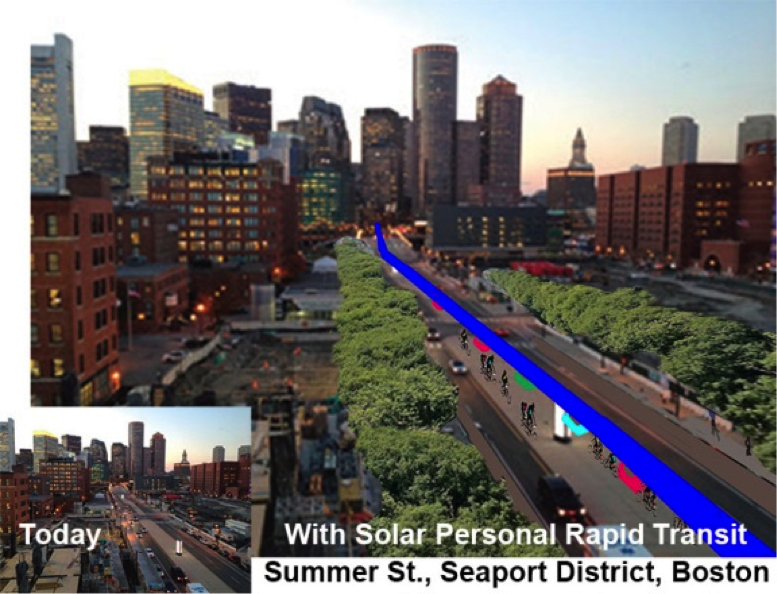 If the Massachusetts Legislature passes S1970, within 3 years, at least 600 miles of solar-powered mobility networks with protected bike paths will be built in the Boston-metro area. Within 10 years, about 6,000 miles of solar-powered mobility networks in Massachusetts will convert $9 billion/year of the current transportation costs into value. This will remove 70% of the oil-powered traffic on roads. Hyperloop is being deployed in Maryland. With the passage of S1970, Hyperloop can be built between Washington DC and Boston and between Boston, Worcester, Springfield, and Albany. JPods and others would connect solar-powered feeder networks to these high-speed networks. Cars would no longer be required to be economically competitive. A new "energy self-reliant" majority will replace the oil-addicted "needful" majority. Provides 110 million injury-free passenger-miles. In the same period, 1.7 million Americans were road-killed. Pays for itself every 5 years. Illustrates a solution for American cities to be independent of foreign oil. Congressional Office of Technology Assessment study PB-244854. Link to 17-minute 1977 video of the benefits experienced since PRT opened in 1975. 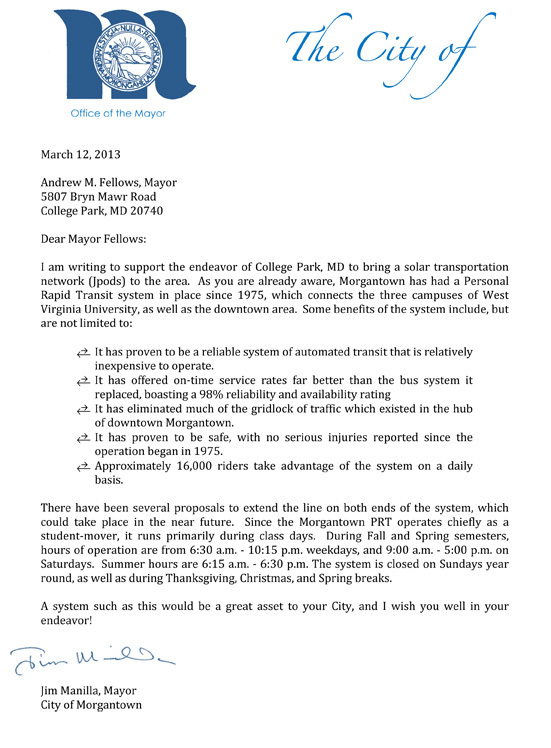 Here is a 2013 letter from the Mayor of Morgantown on the efficacy of PRT network. Morgantown's PRT network is self-regulated, so despite its excellent safety record, it does not provide a repeatable model that private capital can invest in. The Solar Mobility Act leverages the behaviors of the Morgantown networks by combining it with the ASTM F24 standards used to regulate theme parks in most states. A widely used known cost of regulation. Solving Climate Change is an overwhelming problem. The Solar Mobility Act takes the ant's approach to eating an elephant - small bites, lots of friends. Overwhelm complex problems with the small, self-interested, many. Every community can pass the Solar Mobility Act to solve traffic problems, create jobs, save families a car payment per month, and cut GHG's by more than half. Every city in the world can solve traffic problems and save money by implementing the Solar Mobility Act. "Stick": Oil addiction creates the stick, the lack of self-discipline to be energy self-reliant. The Oil Famine experienced in Syria since 2010 will harm cities that remain dependent on unstable and depleting oil supplies. "Carrot": About 90% of current urban transportation costs can be recovered to retain values, hire workers to build sustainable networks, and reward capital for funding solar-powered mobility networks. A catalyst for changing all energy systems. Life requires energy. Oil is finite. 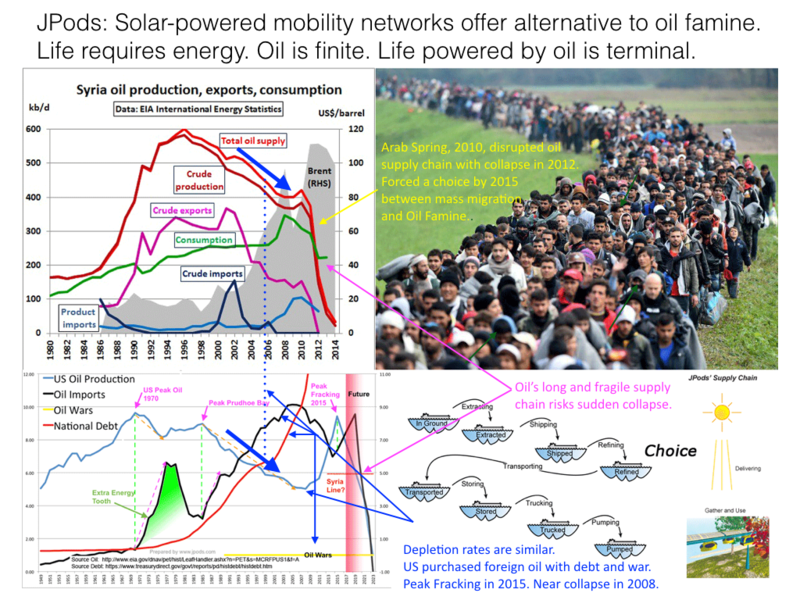 Life and cities powered by oil are terminal. 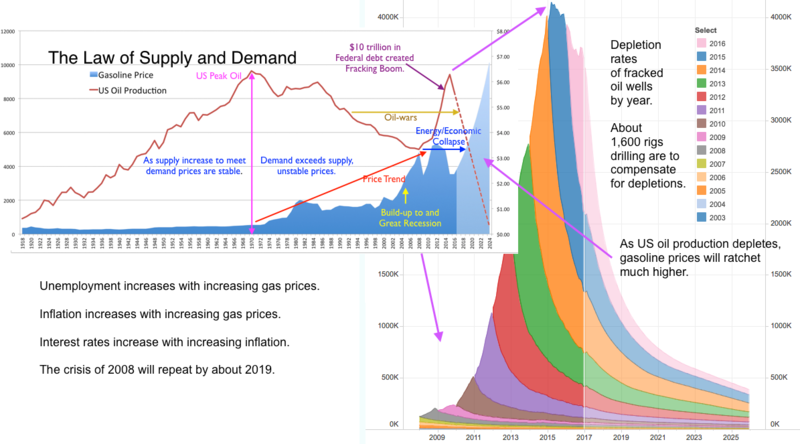 US Peak Oil was in 1970. As access to oil depleted, debts increased in tandem with oil imports. At 3/5 Peak, oil-wars became perpetual. At 1/2 Peak, the Great Recession nearly collapsed the US economy. When Syria hit 3/5 Peak Oil in 2010, the capital structures required to sustain oil's long and fragile supply chain collapsed. Within 18 months, they experienced a 95% loss of access to oil energy - an Oil Famine. Dr. Hubbert's 1956 presentation of US Peak Oil by 1970. Admiral Rickover's 1957 speech on "Energy Slaves." In all of human history, transportation has been the catalyst for changing energy systems. Governments implementing the Solar Mobility Act will encourage transportation to be the catalyst for changing their economic lifeblood from oil to ingenuity. Paddle a raft; build a water wheel. Sail a boat; build a windmill. Ride a horse; harness a horse to a plow. Railroads provided the transition from biofuels to fossil fuels. Railroads tuned their engines to use coal and oil, creating a stable market for the extraction industries to scale to commercial viability. Oil prices were low and stable until US Peak Oil in 1970. Solar-powered mobility networks will replace fossil fuels with solar power. The 10x efficiency gains of solar-powered mobility networks more than make up for the cost of transitioning to solar. Using the distributed nature of the transportation network to harvest the energy to power the networks makes the networks durable against oil supply disruptions and grid blackouts. The Physical Internet® will deploy a city at a time as the Solar Mobility Act, or similar legislation, defines a regulatory environment that is acceptable for capital to invest in. The scale of deployment in the US is estimated to be about 500,000 miles. This is about 4 times the miles of freight railroads and 1/4 the lane miles of urban highways. ASCE Report Card rates US roads a "D" and transit a "D-" with a $2 trillion cost to fix. Fixing current infrastructure would not reduce the $1.5 trillion/year traffic costs. A 500,000-mile retooling to solar-mobility would cost $5 trillion and cut costs by $1 trillion/year. Network Prime Example: Grand Junction Line through the MIT campus. Changes in communication illustrate the effect of eliminating a government monopoly. In 1982 courts enforced the Constitution to end the Federal communications monopoly. Radically more efficient and lower cost communications resulted. The Solar Mobility Act ends government road and transit monopolies that are the root cause of GHGs. Since 1934, Federal policy has been to expand GDP by consuming as much as possible, as fast as possible, by borrowing as much as possible. Climate Change is a consequence of "The undisciplined pursuit of more." Adopt the Solar Mobility Act so families experience how they can save a car payment per month by powering urban mobility within a solar budget. Build solar-powered mobility networks to awaken commercial interests to the fact that pollution is lost profits, resources consumed with a negative value. Order the US military to obey the orders of eight Presidents to end foreign oil addiction. Defund terrorism by immediately cutting military use of oil by 50%. Pass a $30 a barrel tax on foreign oil to be applied to paying off the debts accumulated in oil-wars since 1991. Children should not carry the cost of our sloth. Rally everyone to plant a Victory Garden. Energy self-reliance starts with the self. Consider how fast people adapted to Uber. It is digital technology applied to the analog highway. JPods, ET3, Hyperloop digitize the networks. People hate, truly hate traffic. Traffic costs Americans $1.5 trillion/year. Free markets will convert $1 trillion/year of costs into customer savings, jobs, and profits. A "needful" majority addicted to oil will be replaced by workers profiting by building solar-powered infrastructure. Oil-powered self-driving cars are operating on city streets. Why cannot solar-powered self-driving cars operate on grade separated rails? Kiva Systems proved there is a huge capital advantage in digitizing mobility networks. They received a $33 million in capital in the early 2000s and sold themselves to Amazon for $775 million in 2012. The 90% savings are covered in the next section. Podcar networks, like JPods, get you to and from local destinations. JPods is focused on the niche of the highly repetitive urban transport of people/cargo, with payloads less than 500 kg (half-ton pickup) within commuter-range travel. DOT's death rate is 106 deaths per million. Theme parks have a 0.2 serious injury-rate per million. Five years of solar collection data documents that 40,000 vehicle-miles of power are collected on a typical day. Swenson Solar system at in Santa Cruz, CA. Excess energy electrolyzes water into hydrogen and oxygen. The hydrogen is mixed with CO2 to produce methane for storage offline or piped to where needed. Burning with the oxygen in a closed loop system supports net-zero carbon energy storage without mining of lithium or other metals. Gathering 5 megawatt-hrs per day is going to create a large and stable market for other energy storage innovations. Who eats lunch and who is lunch illustrates the struggle for energy. War is an extension of energy competition by societies. Peace is the enforced absence of war. JPods networks enforce the ability to be energy self-reliant. These types of networks preempt and prevent oil-wars (happening since 1991). Grade separated rail networks do not consume the real estate of roads. 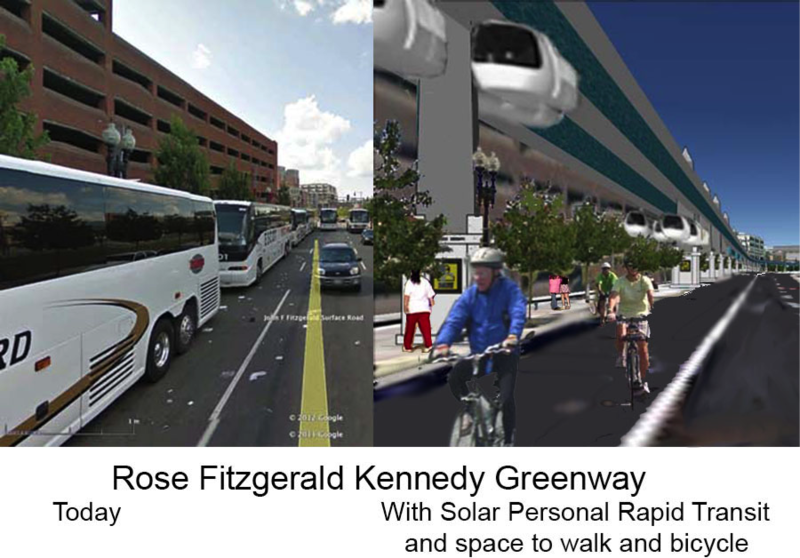 Urban areas designed for cars will see a substantial return to green space. When you push a button in an elevator, you are riding in a vertical podcar. Podcar networks provide on-demand personal mobility regardless of age, ability, or wealth. There are "food deserts" in cities where delivering goods and removing garbage is congested. Podcar networks remove both those defects. "Mom & Pop" companies will have the logistical process of Walmart. Podcar networks level the economic playing field. Improved logistics will shift cities to being more walkable and bikeable. Grade-separating the machines from the organic plane of encourages walking and biking. The ability to carry bikes in JPods further encourages biking. Instead of feeding rats for half a week between garbage truck collections, waste products stream out of a community as easily as resources stream into them. 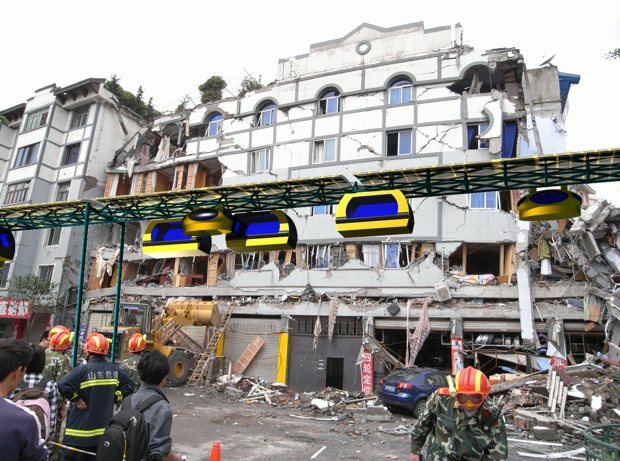 As networks come online to solve persistent traffic problems, the manufacturing capacity will grow enough so that a portion can be diverted to build temporary Rescue-Rail™ networks, restore logistical services, and reduce costs of disaster recovery. There are profits, not costs. Costs to be clean are widely misunderstood. The oil/coal burning infrastructure at the root of Climate Change is protected from competition by a Federal monopoly. Net energy profit in retooling from oil to solar is 6x of cost. 1/50 the cost of buses. 1/25 the cost of passenger-trains. 1/10 the cost of cars. In the early 1900's, oil's Net Energy was 100:1, a hundred barrels of oil could be delivered to the market for every barrel required to obtain it. As oil resources have continually depleted, the Net Energy of oil has decreased. Currently, fracking and oil-sands have a Net Energy below 5:1. In contrast, solar and wind have a Net Energy over 20:1. It is impractical to use solar power to move the two tons of car used to move a person on the highway. However, when overhead rail networks are granted Rights of Way access, solar collectors over the rails can typically gather 40,000 vehicle-miles of power per mile each day. These are the savings that will attract private capital to fund solutions to Climate Change. 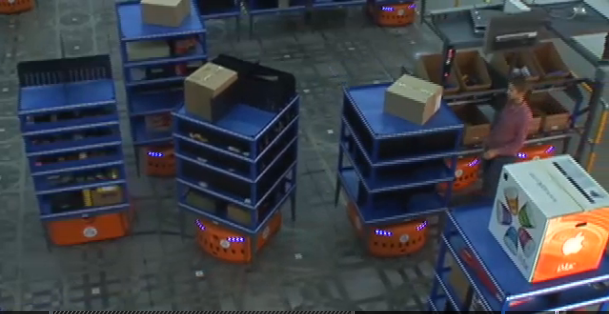 As networks are constructed the spare energy from JPods networks will power the factories building components. Industries will see it is profitable to be self-reliant and to power factories with solar. JPods partnered with Frank Pao because his BITERS (Building Integrated Solar Thermal) are the low-cost way to build and operate building over time. Buildings built in our networks are designed to be Net Zero. 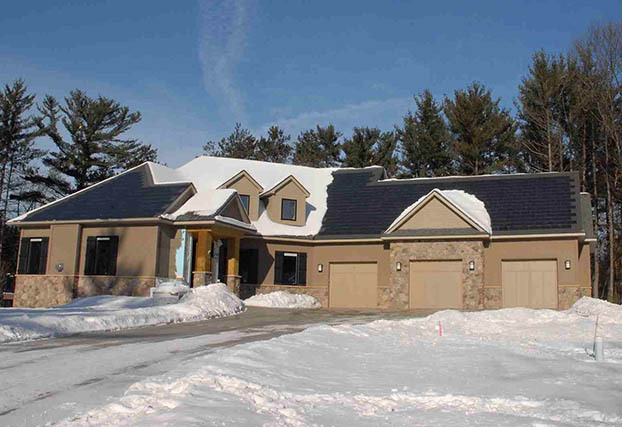 Here is an image of Frank's Net Zero house that won the competition at Bejing Olympics. Aesthetics matter. 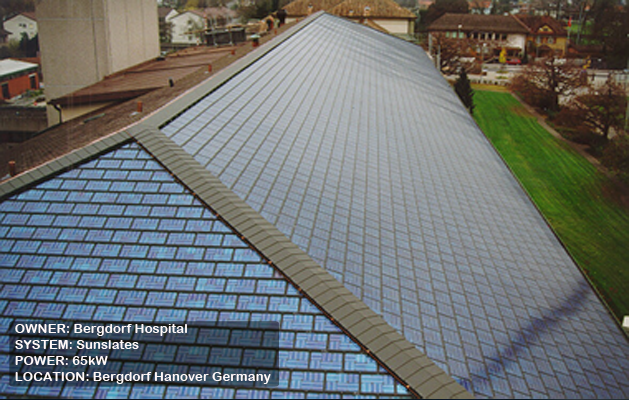 Stations will be designed to integrate light play by spacing solar cells. 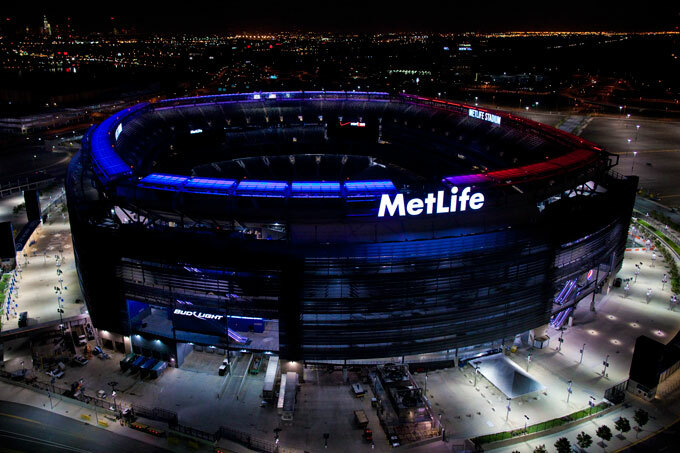 The scale of applying solar to commercial building is illustrated by the installation at MetLife stadium in the Meadowlands. Durability is a value that is capitalized onto JPods P&L and Balance Sheet. Long-term costs such as oil-supply crisis, wars, unstable governments are real and devastating. That these long-term costs are not accounted for is foolish. It is profitable to exercise the self-discipline to be energy self-reliant. Residential buildings, like commercial buildings, should be built to last, not built to flip. 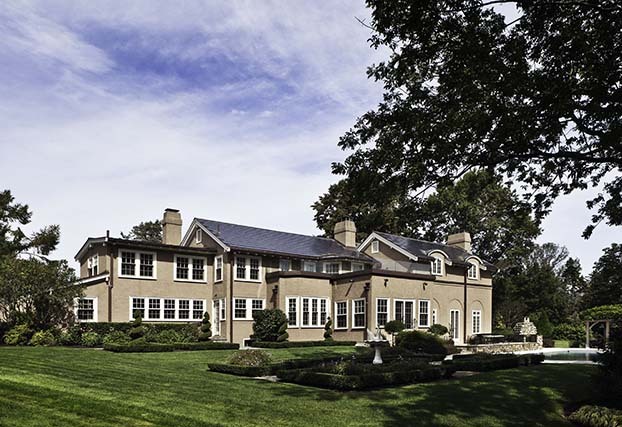 As JPods and Frank Pao build commercial buildings to last, it is expected to expand the residential market where the solar collection system is designed to be the roof. As soon as a city adopts the Solar Mobility Act, capital will invest and construction will begin. As the manufacturing base comes online, it is likely networks will deploy at the rate the Transcontinental Railroads were built in the 1860's, 3 to 10 miles per day per crew. There can be hundreds of crews. Recommend reading the book Nothing Like It in the World for how the Transcontinental Railroads were financed and built. Bengaluru is proceeding towards granting Rights of Way for solar mobility networks. The Grand Junction, Track 61, and North-South Station networks can be built within 2 years of the passage of S1970 in Massachusetts. As the first solar-powered mobility networks demonstrate there is a 90% conversion of cost to value, deployment of networks will progress as fast as crews can be trained and manufacturing can supply deployment. Building 6 miles of networks per day, installs 6 megawatts of collection power. Working 300 days per year, a JPods crew installs 1.8 gigawatts. When there are 27 crews working, their installations will equal world solar deployment in 2015. Converting 90% of current costs into value will fund hundreds of crews. Cost per use declines as solar use increases. 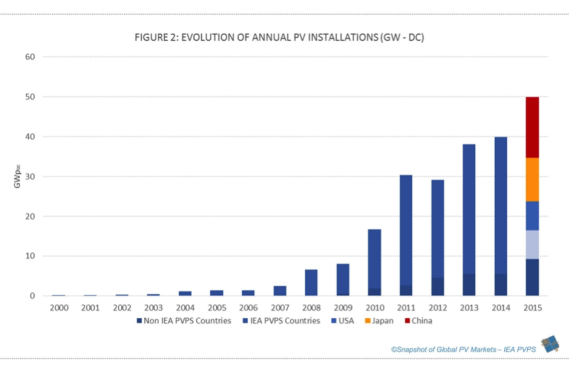 Solar exhibits a "learning curve" as oil did in the 1860s. Scale of deployment increases radically with solar-powered mobility deployment, and costs decrease with innovating capture and storage technologies. Admiral Rickover's 1957 speech on "Energy Slaves"
Illicit Energy is the dependence on energy outside self-reliance. Federal support for foreign oil exactly repeats the path to war of Federal support for slavery. Eight Presidents declaring oil addiction a threat to national security. Further proved by oil-dollar funded terrorism and oil-wars. (Madison, Monroe, Jackson, Polk, and Buchanan). We are out of time. Life requires energy. Cheap oil is finite. Life powered by cheap oil is terminal. 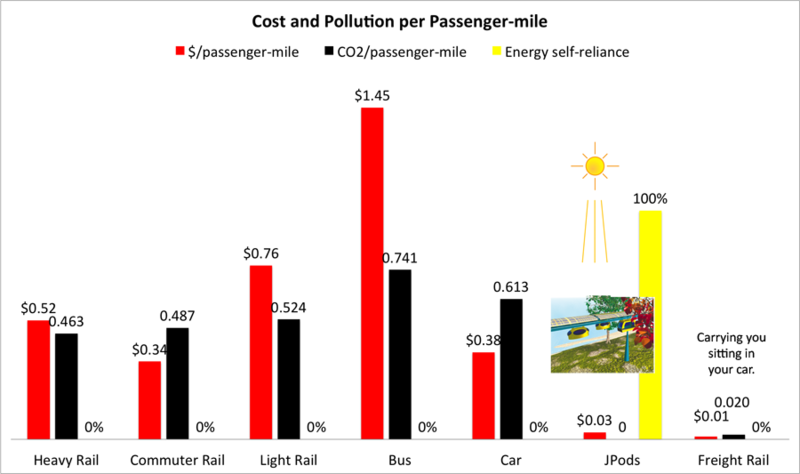 Solar-powered mobility networks convert 90% of oil-powered costs into value. And, operate with zero GHGs. Bill James founded JPods in 1998. As a West Point graduate and Infantry veteran, it became clear to him that the oil-wars since 1991 would continue as long as America was funding its enemies with oil-dollars. That fear has proved a reality. As a child, Bill had cleaned his grandfather's pig barn with a half-barrel suspended from an overhead rail. He noticed that even a small child like himself could move tons of material without the problems of ground clutter or energy exhaustion. Later as an Infantry officer, Bill used helicopters with cargo nets to pick up and precisely deliver logistical support. The two experiences combined to help formulate Bill's unique vision. After the military, Bill worked at Honeywell setting up their manufacturing facilities and implementing Just-in-Time processes. In 1986, he founded Applied Statistics (now ASI-Datamyte) to apply computer networks to control manufacturing processes based on Just-in-Time, Six Sigma concepts. In 1989, Bill started writing WebClerk software to apply computer networks to the marketing process. In 1998, that product was named "Best New High-Tech Product of the Year" by Twin City Business Monthly. It was also on two national tours with Apple Computer. In 1998, Bill set these efforts aside to focus on applying computer networks and "Just-in-Time Lean Thinking" to the mobility process. The team at JPods has since grown to over 50 people working without paychecks. These co-founders are in the US, India, and China. The team closely mirrors the people who were working on the Internet before the Rule of Law was restored in 1982. There is a huge need to solve traffic problems, but without S1970 or similar regulation, capital cannot and will not invest. 2007 Study by New Jersey Legislature on PRT. US Senate Letter on podcar networks from 1974. Had policies, such as the Solar Mobility Act, been put in place in 1974 an important opportunity would not have been lost. Morgantown's PRT network delivered 110 million injury-free passenger-miles. In that same period, 1.7 million Americans died on roads. Highway miles traveled increase by 2.4 times. Public proposal: Anyone will be able to edit this proposal. The proposal owner can limit editing to team member using the proposal''s Admin tab.